Mo asked for indigo vat instructions. Probably there are better ones online but here’s a brief explanation of my experience yesterday and OK. I’m forced to admit that when it comes to starting an indigo vat, it IS important to measure AND pay attention to water temp. When I got home from the workshop, I pulled out my stash of dyeing supplies. Stuff I had used over a year ago with barely marginal success. Wondered if there was a shelf life for the goods but decided to concoct the 1-2-3 indigo vat just the same. This ratio stands for 1 part indigo, 2 parts calcium hydroxide (pickling lime) and 3 parts fructose/per liter of water. In the past I’ve just eyeballed the proportions. 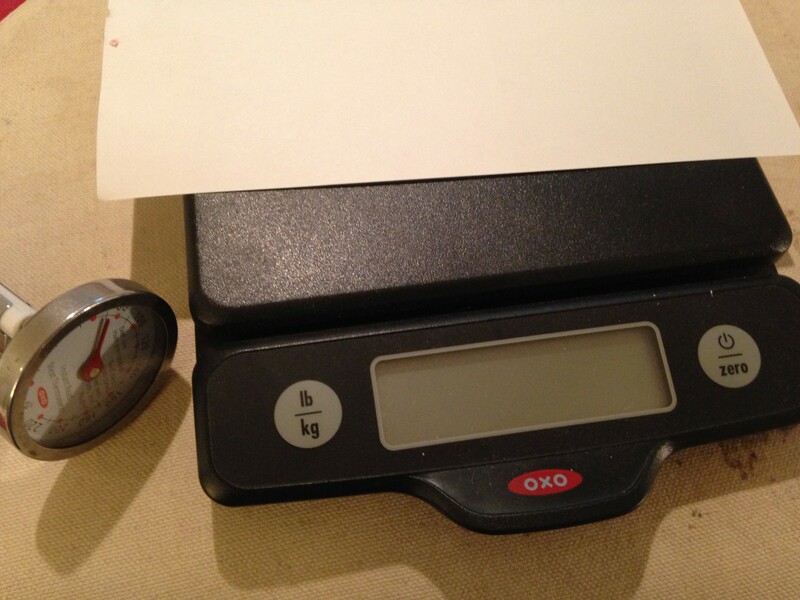 But this time I was able to use the scale my sister has for weighing weaving fibers. The day before I had placed the indigo powder in a small pickle jar (empty) that still smelled like pickles. Added a few small stones I picked up when I was having lunch with a dear friend. Then added hot water (quantity and temp not measured) and shook the jar for a few minutes. The stones helped mix up the powder which has a tendency to lump up. This mixture sat overnight. 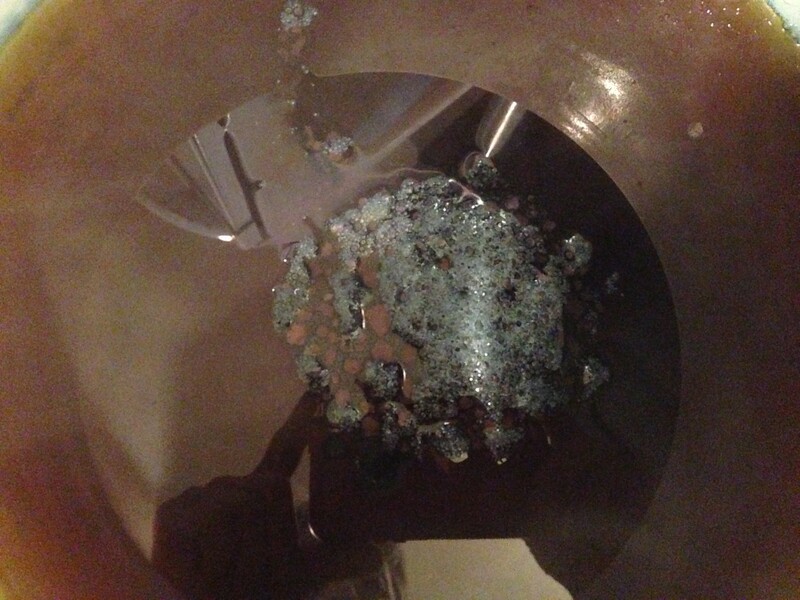 So yesterday I measured out the fructose and calcium hydroxide, dissolved the fructose in 180 degree water–dissolved the calcium hydroxide in cold water per instructions–poured the liquid indigo into the vat, added fructose and calcium hydroxide and within a matter of minutes a bloom started forming on top of the surface. The bloom is a good thing. Stirred energetically and then let the vat rest overnight. This morning I skimmed off the bloom and the coppery surface film and began experimenting. 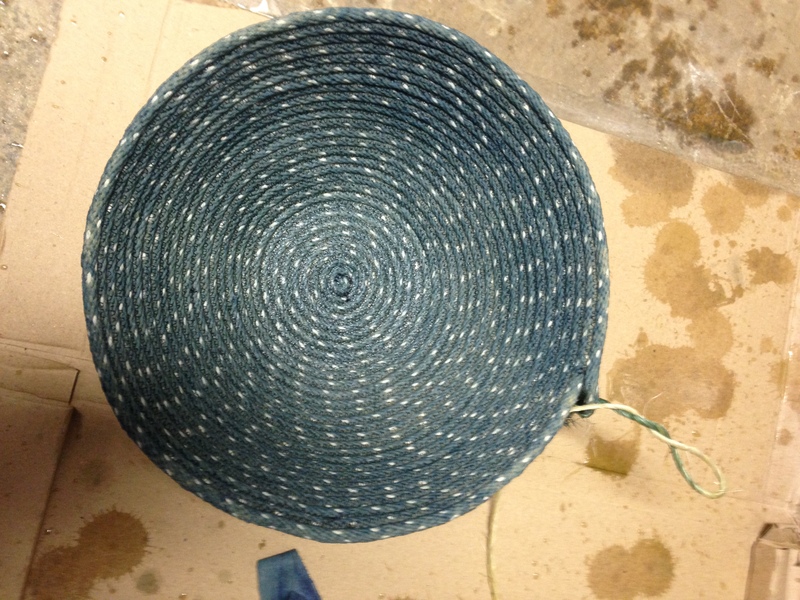 In the interim I have been thinking about the rope bowl/baskets. Wondering how they would look dyed in indigo without wrapping the rope in fabric. The white fleck repeating pattern? That must be polyester in the cotton rope. A wonderful surprise. Oh wonderful! Indigo is a magic substance, as your cloth and baskets show. I’ve never done a fructose bath, but now I’m thinking I might give it a try. The last step, before I forget–neutralize in vinegar solution–we were told this sets the color and may intensify it. it does look like a critter party–not sure where it will end up. I like the tip about using rocks in the jar. I’ll be doing that! actually Cathariine Ellis said to use marbles which i didn’t have–but there are plenty of little rocks around and it works like a charm. 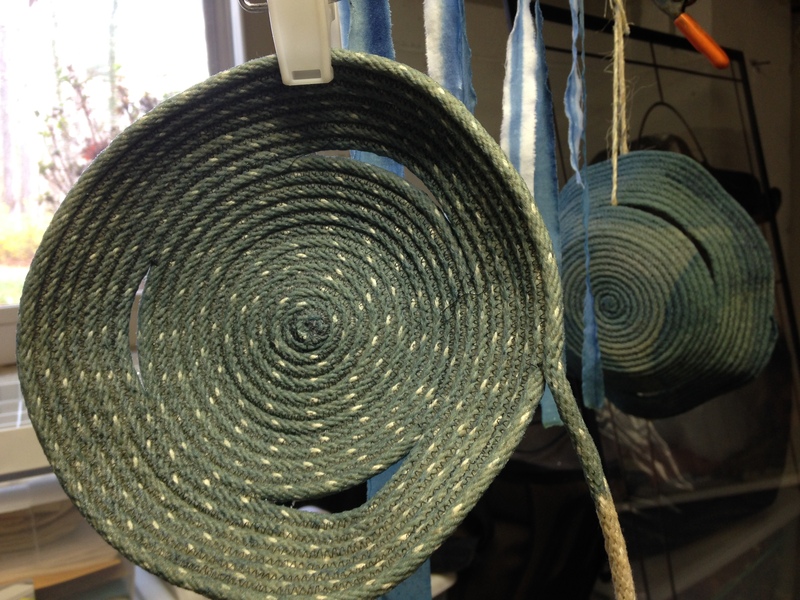 I haven’t tried indigo yet, but these results make it very tempting … beautiful colors! Patricia, that scrap of cloth over dyed in indigo is so mystical and earthly, brown and blue , hand in hand, a beautiful combination. Thanks for sharing the info from your dye classes. I’ve never taken any nor made an indigo vat. What I have done with indigo is plant indigo seeds when I lived in Tennessee that grace had given me. They did grow but then I had to go to CA for two months in the summer. When I got back, the plants were starting to droop and I could see blue in the leaves so I stripped all of the leaves, chopped them up, scattered them in cotton bundles, put the bundles into a large glass jar and kept them in the sun. Pretty sure that this was an unorthodox way to use indigo, don’t know if anyone else has done this but I am always experimenting with dye plants, just charging ahead. 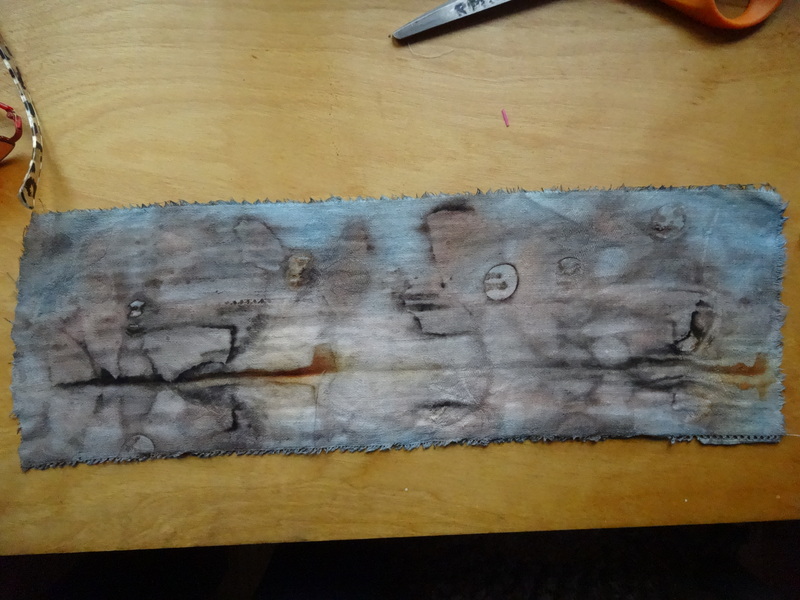 Did get some lovely patterns so I used them in some of my cloth work. Sadly, after a year, every bit of indigo had faded. If I had used silk or wool, I often wonder if the indigo would have held. hi Marti. i too have always just experimented randomly and most often w/o results that really moved me. i’m not sure where i’ll go with this methodical approach. it’s just not my m.o. to follow specific directions–but i’ve got to say the colors that are happening are pretty amazing. so we’ll see.